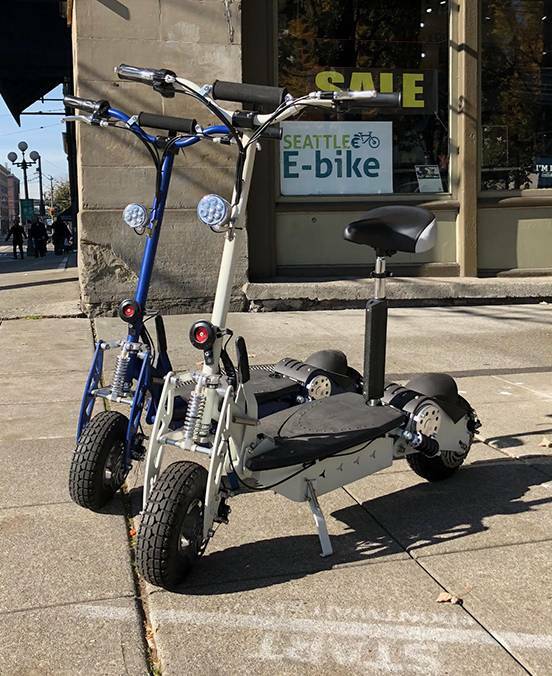 Seattle E-Bike introduced E-Scooters to Seattle in 2014. And we’re seeing more and more people zooming around town on them. It’s a great way to avoid the traffic jams and get where you’re going faster than everybody else. We’ve seen some good ones over the years but we wanted something that could handle rough city streets a bit better than the average scooters. If you’re a bike rider, you know that cities don’t always do a great job maintaining their streets, and riding on small wheels can be a challenge. Our solution? A ten-inch, air-filled tire for a wider footprint and better grip in the rain. I know. You’re wondering how we can offer these scooters at such a low price. Well, it’s because we’ve finally found a supplier of new, lighter-weight models with a choice of ten-inch or eight-inch wheels that we’ll be carrying in the near future for around $999. So to make space, we’re clearing out our older models and can now offer them to you at a ridiculously low price. $299.00! These are fitted with a powerful 800 watt brushed motor that really takes off on a straightaway at 20+ mph. And they have great suspension that can handle potholes, no problem. They’re heavy though, and can struggle up steep hills with a heavy rider so they’re probably not for everybody. That said, how could you not want one at this screaming deal price? List price was $999. Screaming Deal Price - $299. Limited stock on hand. Come get one today while they last.